Laurie Sadowski is the author The Allergy-Free Cook Bakes Bread, an active food writer with two degrees in music (education and musicology), and a certified Personal Trainer Specialist and Nutrition and Wellness Specialist. Caryn Hartglass: Hello everybody! I’m Caryn Hartglass. You’re listening to It’s All About Food. Of course you are. Thank you for being here with me. I can feel you all and it feels good that we’re all joining together to talk about my favorite subject, food. Sometimes it’s a happy story, sometimes it’s a not-so-happy story, sometimes it’s a delicious story, but it’s interesting all the time, at least I think so. And one of the things I’m also excited about is we’ve been transcribing all of these shows. I’m so grateful for all of the volunteers who have been doing these transcriptions. What’s fun is I’ve been learning things from them as well as them learning things from the programs; it’s been a real give and take and give, give, give all around. But the great news is that we are totally current with 2013, we are almost all finished with 2012 interviews, and we’ll go back for the few years before that, and it will all be there for you, for free, at responsibleeatingandliving.com to listen to or read – your choice. Lots of wonderful information there. Thank you for supporting it and listening. What else can I tell you about responsibleeatingandliving.com? I go from time to time and try to make the website a little bit easier to navigate. You might go to the It’s All About Food tab where you can see what guests are coming up. You can see everyone that’s been on the show at Guest Interview Index in alphabetical order by first name. And then all the archives from 2012, 2013, 2011, 2009, and 20010. There’s lots of good things there. Now, let’s get to the delicious part of the program, please! We are going to be speaking with someone who has already been on the show, and I’m looking forward to having her back. Laurie Sadowski is the author of Allergy-Free Cook Bakes Cakes and Cookies. She’s the author of The Allergy-Free Cook Bakes Bread and is an active food writer with two degrees in music education and musicology. She’s a certified personal trainer specialist and nutrition and wellness specialist. Welcome to It’s All About Food, Laurie. Laurie Sadowski: Thank you very much for having me. Caryn Hartglass: Hey, how are you doing today? Laurie Sadowski: I’m pretty good, thanks. How are you? Caryn Hartglass: Good! So I’m looking forward to speaking with you in the next 30 minutes or so. There’s a lot of good things to talk about, but first, let’s talk about that evil wheat a little bit. I’ve read so many different things about wheat, and there’s more and more information about wheat in the news and in magazines and in medical journals because so many people are having issues with it. But some of the things that have been surprising me are how much wheat we’ve actually eaten. There were times, I think, when people here in the US in he early 19th century, got about 30% of their calories from bread. Laurie Sadowski: Yeah, that’s not surprising. Caryn Hartglass: Also, somebody was connecting the dots recently. Because of global warming, if you want to call it that, there are all kinds of weather issues that are affecting wheat crops. And you have people in Egypt, for example, many of whom still eat 30% of their calories from wheat. They were connecting the dots, saying that maybe some of the turmoil in the Middle East is due to these people who are starving because the cost of wheat has gone up, because of global warming and droughts, and they spend about 35% of their income on food. So there’s all kinds of interesting stories on wheat. Laurie Sadowski: It definitely has a big connection across the board, not just with celiac or special diets. Caryn Hartglass: It just amazes me, boggles my mind – because so many people have lived on it, and on so much of it. And now it has becoming problematic. Caryn Hartglass: Any thoughts on that? Laurie Sadowski: I think that a big issue with it, becoming more of an issue, is that with genetically modified crops and things like that in an area where we do rely on a lot of wheat consumption in general, it might be cheaper or other grains aren’t as – I don’t want to use the word popular – but in the last year, we’ve obviously heard a lot more about quinoa, for example. Quinoa is very popular grain, but it’s definitely much cheaper to rely on something like corn or wheat, but then when they’re genetically modified crops, we’re just eating too much of them because they’re often put in other products as well. You can see corn as a filler in everything – everything from candy to a loaf of bread that should be maybe even whole wheat. So it’s just everywhere and it’s cheap, so that’s why it’s in everything. Caryn Hartglass: It’s artificially cheap. It may not really be cheap, but we see it as cheap because the government supports those crops. And you’re probably familiar, there’s this one book that’s been on the bestseller list for a while – Wheat Belly? Laurie Sadowski: Yes, I am familiar with it. Caryn Hartglass: I had interviewed Dr. Davis on this show. There were parts of the book I liked a lot and parts I didn’t like at all! But he did bring up some interesting things about the history of wheat. I personally didn’t care for what he promoted as a diet, and I also don’t believe that you can lose dramatic amounts of weight just by eliminating wheat from your diet. That was kind of a big, lofty claim. But it was very interesting, about the history and how wheat has been developed over thousands of years. Laurie Sadowski: – their points though, on wheat consumption, are good points. I’m not saying that everyone needs to give up wheat, or the way you said, it’s certainly not a weight loss diet, but just like we wouldn’t eat apples all day, we have to vary how much we’re eating. We wouldn’t eat 30% of our diet of apples, just like we shouldn’t eat 30% of our diet on one single grain. Caryn Hartglass: I think a lot of people attribute weight loss, sometimes, to a particular diet – but most of it is just that fact that they’re trying to follow a diet. Just the fact that they’re concentrating on what they’re eating: all of a sudden when they’re paying attention, they can lose weight because they’re making some sensible choices, because they’re thinking about what they’re eating. Laurie Sadowski: Yes, I agree with that very much. I think that when people say, might go on a low-carb diet, I think that gluten-free often gets confused with the words low-carb, because they think that they’re just cutting out grains. A grain-free diet, perhaps, but not wheat or gluten-free, because there are so many other grains; even if they’re referred to as quinoa or millet or something like that, they’re still these high-carbohydrate ingredients that aren’t what people should be including in their diet. But people are often also saying, I feel so much better because I cut out bread and pasta and I’m gluten-free, but they also might not be looking at the amount of grains they’re eating that are hidden, or they might have chosen to go on a low-carb diet and therefore lost weight because they’re eliminating a whole food group. Caryn Hartglass: People really don’t know what’s in their food unless they’re really, really paying attention. Sometimes it takes a lot of attention. Even if you’re reading ingredients, you may not be sure where they come from, if they might be cross-contaminated – it gets really complicated. Laurie Sadowski: It can certainly be exhausting. Caryn Hartglass: Yeah, okay. So, that’s wheat. Before we get into your new book, we’ll get to that soon enough, I wanted to mention that I have your old book about baking bread – and it’s not that old, when did it come out? A year ago? Laurie Sadowski: A little bit over a year ago. Caryn Hartglass: I hadn’t used it very much when we had talked about it, and I’ve got probably a gazillion cookbooks, but mostly because I talk to a lot of cookbook authors on this show. So I don’t get to know a lot of cookbooks very well. I also just like to make stuff up in the kitchen. But occasionally, something leads me to a book, or I want to compare notes with a bunch of different cookbooks – and anyway, short story long, I got into your bread baking book. It is excellent, really. Caryn Hartglass: So I’ve been looking in different gluten-free baking books, and I want to give you an A+. Laurie Sadowski: Oh, thank you. Caryn Hartglass: To start with, that book and this new one are relatively light and thin. But they’re not light and thin on information. Laurie Sadowski: Thank you, I appreciate that so much, seriously. Caryn Hartglass: Now, I have to share one of the secret ingredients in one of your recipes, and it’s two tablespoons of ground almonds. It does amazing things to the flavor of pizza crusts or breadrolls – amazing. Laurie Sadowski: Well, I appreciate you hunting down those secrets! But they do; they add a nice, pleasant flavor, some nice texture as well. Without having to use too much, you can easily ground it yourself. You don’t have to buy a bag of almond flour or something. I try to make the recipes as accessible as possible to everyone. Caryn Hartglass: A lot of people tell me they can’t be like me, and I always think, why not? I like to spend time in the kitchen. I haven’t started grinding my own grains yet, but I like to make things as wholly from the essential ingredients as possible. So one of the things I have is a coffee bean grinder that I use regularly for flaxseeds, occasionally for spices, and to grind those two tablespoons of almonds whenever I’m making on of your recipes. I think it’s important because nuts and seeds, for example, can go rancid very quickly. Laurie Sadowski: Right, that’s very true. A lot of people don’t know that, especially even with gluten-free flours, that a lot of them should be stored in the fridge or in the freezer if you don’t have the room in the fridge. Especially when they’re already ground, that’s a big thing to know. Caryn Hartglass: So I don’t want to buy almond meal. Caryn Hartglass: I want to make it up quick and it’s really not that difficult to do that. I’ve made the pizza crust, and I’ve used Miyoko Schinner’s recipe for almond mozzarella cheese. Laurie Sadowski: Oh yes, she has some pretty amazing recipes in that book. Caryn Hartglass: And it’s amazing – with a homemade, delicious tomato sauce – it’s pizza! Laurie Sadowski: Yes, for sure. Caryn Hartglass: That pizza crust tastes like real pizza crust! Laurie Sadowski: Thank you, I really appreciate it! That’s really kind of you. Caryn Hartglass: I’m very excited about it because I’m sincere. This is really good stuff. Let’s just talk a minute about what’s available int eh stores today. There’s so many products now for people who have gluten intolerance. I remember when I was young, in the days of Betty Crocker and Duncan Hines mixes, I never understood why anyone would want to buy a mix, okay? That’s just me. But if you read the ingredients on a mix, what is it? It’s basically flour, baking powder, sugar, not much else. Laurie Sadowski: Usually that’s just it, sometimes a pinch of salt, and then it just gives you guidelines for what to add. Pretty brainless. Caryn Hartglass: You can’t do that yourself? I mean, I just don’t get it. That’s just me. But then you add another level of complexity when it’s gluten-free. But there’s still gluten-free mixes out there, and I’ve tried a few. For my palate, they’re usually too sweet if they have the sweetener in them. They’re gummy – they’re not very good. Laurie Sadowski: I think it’s because they’re a one-size fits all type of thing, right? So if it’s a company that’s making a lot of them – and this doesn’t go for all of them, I certainly haven’t tried all of them, I’m sure that’s there’s ones that are very good – but they can’t use, or they shouldn’t use, the same flour mix for every single item. So if there’s a company that makes, say, bread and cakes and muffins, and if they’re using the same combination of flours or a single flour for their recipes, that’s why they all taste the same. There’s no way that the same ratio of ingredients as well as the exact same flour mixture is going to work for, say, a yeast bread – like in my first book, you won’t see the exact same ingredients for a yeast bread as you would in a cake in the second book. And the third book, when it comes out, the same with pie crusts. They all have different combinations and ratios, which makes them what they are. But many cake mixes and stuff like that either don’t have a proper combination or a proper ratio. Like the Betty Crocker, for example, I’m pretty sure it’s just rice flour and potato starch? Or it’s rice flour and a starch. I don’t even know how that can mimic wheat, that combination. Caryn Hartglass: I know what you mean. So when you make a wheat-based cake, like I said before, it’s wheat flour, baking powder, sugar, a little salt, a liquid, it could be water or milk, and then whatever flavorings. You might want a binder, because in vegan baking we’re not using eggs, so a lot of us have gotten accustomed to using a flaxseed and water mixture, maybe banana and applesauce…but okay. Gluten-free baking. That’s where you come in. Laurie Sadowski: I hope so! Caryn Hartglass: I don’t know what your refrigerator looks like, but on my top shelf, I have fifteen large jars. They’re five in a row, three jars deep. They’re probably two quarts, and each of them has a different powder – all-purpose gluten-free, garbanzo beans, sorghum flour, brown rice flour, tapioca starch, potato starch, buckwheat flour, and so on. Laurie Sadowski: You’re like your own personal grocery store in there, that’s awesome. Caryn Hartglass: Yeah, and I like to have backups in the freezer. Laurie Sadowski: I hear you. I have lots of that. Caryn Hartglass: Because with gluten-free baking, the stores are getting better at supplying them, but they don’t always have what you want. Laurie Sadowski: And that’s true too. I know I always have people contacting me asking where they can buy things, or where it’s cheaper to buy things, or if it’s safe to buy things in bulk. Sometimes, as a Canadian, it;s hard for me to make recommendations if someone lives in the States in a very small town or city. But in the States, you guys can pretty easily order off of Amazon.com, which sounds like a plug for them, but it’s really not, because I wish they would ship to Canada. But they have amazing things that you guys can order, and that’s usually a pretty easy way for you guys to get a hold of it. But if you’re about to start baking, you definitely want to be able to hop down to the store and get whatever you need, weather it’s sorghum flour or coconut oil, something easily accessible. But you’ll certainly have a large supply once you get them all in your arsenal. Caryn Hartglass: But it’s really not a scary thing, especially when you have a book like this to go through. So there may be three, four, five extra ingredients. Caryn Hartglass: But I just say, get over it, get your hands into it, and make some really great food! Laurie Sadowski: One thing I definitely try to do in the book is to try not to use too many flours. I sort of just stick to about five or six of them, as a whole, as opposed to the over 22 or so gluten-free flours that are available. Laurie Sadowski: For example, in my first book, coconut flour was not really anything. No one knew about it when I was writing my first book. It was very hard to find and very expensive. Now, it’s a heck of a lot more popular. I also know that if people are buying my first book and they’re sort of used to the flours, they’re probably going to want them in the second book too. For example, I really love sorghum flour. And sorghum flour plays a leading role in most of my recipes. Caryn Hartglass: I love it too. Laurie Sadowski: It has a great taste, it’s not too expensive compared to some of the other gluten-free flours, it’s good for you, full of fiber and B vitamins, and I really like that it has a bit of natural sweetness, that’s it’s high in fiber – it’s an all-around really good flour to have. It’s pretty easy to find, and if not, you can usually order it in. But now I’m seeing it quite often. I didn’t see it that much when I started using it, but now it’s pretty much everywhere I go. I might be because everywhere I go, I say, you have to stock yourself up with sorghum flour. But either way, I do see it all the time, a lot more easily now. And it really is a good flour on have on hand. Caryn Hartglass: I think it used to be a lot more popular decades ago, but somehow, we just based ourselves on wheat. Good old wheat. Laurie Sadowski: That’s true too. I see a lot of very old recipes using sorghum grain, which I haven’t even seen in person. I know there’s some companies that sell it. Again, maybe if I could be near like a whole foods int eh US or something, they might have it. But I agree with you. And same with sorghum syrup – that was often used instead of molasses in a lot of old recipes. But I don’t think I’ve ever seen sorghum syrup on a grocery shelf. Caryn Hartglass: No, I haven’t either. Interesting. So aside from the basics that go into a cake, let’s say, we have sorghum flour and some starches. Can you talk about what those starches are and why they’re included? Laurie Sadowski: I do include some starches, but I try not to include too many because I want to keep the nutrition factor as well. But I do add a bit to lighten it up, to give you that cake texture. I certainly want to make sure it tastes like cake, and not something dense and too healthy. Starches sort of play a role in gluten-free baking, and in addition to what I mentioned about lightening it up and adding the right texture, it also helps with binding, because you’re lacking what you mentioned before, the eggs, because of vegan baking. So just like when you’re making pudding or something like that and you use corn or tapioca starch to thicken it, it does the same thing when you’re baking, and then you can omit those eggs without worrying about it crumbling as you bite into it. You don’t always have to worry about something like flaxseed to keep it together. It also gives a nice texture. Tapioca flour has a bit of a chew to it, so it’s nice in things that you want that stickiness. Like in something like a cookie that’s a little chewy on the inside, tapioca flour does wonderfully for that. Caryn Hartglass: What’s really crazy these days, and I think it’s more so than before, though I don’t have any proof of it, is that there’s more allergies out there everybody’s talking about. And you cannot please everyone, it seems like, because people have wheat allergies, soy allergies, egg allergies, dairy allergies, or they have ethical issues to eggs and dairy. And some people have nightshade allergies, like tomatoes and potatoes, and some have corn allergies, legume allergies…some people can’t eat some beans, and some people can’t eat some nuts. It’s really crazy. Laurie Sadowski: There’s definitely quite a spectrum. I often hear from people who are talking to me about various reasons why they are gluten-free, and I always hear about nightshades and things like arthritis or fibromyalgia, or anything related to that kind of joint pain. They always say that the two biggest things that help them were removing gluten and nightshades. For these types of reasons, I don’t include nightshades in my book; I don’t use potato flour or potato starch. I also don’t use any legume flours like chickpea flour; there are some in my first book, but not really at all in the second book for the reason of legume allergies. Some recipes do call for Earth Balance, for that buttery flavor, because sometimes you need that buttery flavor. And that does have pea protein in it, way down on the line of the list of ingredients. For people who are sensitive to these other things, I’m sensitive by knowing that, so I make sure my recipes are as accessible as possible without having to rely on such a mix and match of flours where they might have to end up substituting a lot, which they might not be successful with because of the different weights. You know, I just want everyone to be able to enjoy them. That’s my biggest goal there. I enjoy them, and I want people to like how they taste too. Caryn Hartglass: That’s very nice. Caryn Hartglass: But what’s amazing to me is – from a chemical background, I have a background in chemical engineering, so some of this is interesting to me, what you can substitute for one or another, just from a chemistry point of view – but when you touch corn starch or potato starch or arrowroot starch, they all have very similar qualities. You pretty much can intermix them without much trouble. Laurie Sadowski: For the most part, corn, tapioca, and arrowroot, primarily. Potato is a little heavier in weight, so it doesn’t always work out the same. But I’d say that the two that are the most similar are tapioca and arrowroot starch. They’re a little gummier. If you were to make pudding or something like that, or if you wanted to thicken a sauce, either way, I find that those two almost have a gummier consistency – whereas cornstarch, when it hardens, is more like jell-o or gelatin, as opposed to the gummy stickiness that arrowroot and tapioca give. So I find that the easiest ones to mix are those two, and then the other two are not quite as easy, but workable for sure. Caryn Hartglass: So you don’t use rice flour? Laurie Sadowski: No, there’s no rice flour at all in that book. Caryn Hartglass: And why do you not use rice flour? Laurie Sadowski: I don’t use rice flour for a few reasons. One of them is that I don’t like the taste of it. I think it has a very distinct taste to it, and I can taste it when I eat other products or if I’m somewhere that bakes with it. I also don’t like the texture itself, it’s not much to be desired. And it just sort of lacks nutrition. Compared with all the other ones, it just sort of falls short. I would rather use something that has more nutrition and a little more wholesomeness to it it. Like, I wouldn’t use all-purpose white flour if I wasn’t celiac. I”m certainly not going to use white rice flour because of that reason. And brown rice flour, again, it’s a little heavier, it gives a bit of a denser consistency. I don’t think, compared to mixing the other flavors together, that it does well in making something taste just like the real thing, which is my ultimate goal. I don’t want it to taste like a substitute, or, this is a pretty good cake for gluten-free or vegan. I want it to taste exactly or better than you remember. And I don’t think white rice flour can do that job successfully. Caryn Hartglass: Right. Well, semantic-wise, I don’t want to say “like the real thing.” I think tasting like you remember and better is a better way to put it, because they’re all real. Laurie Sadowski: Yes, that’s true. Caryn Hartglass: It’s just that we’ve been socialized in some way to certain ingredients. And it’s incredible. We all think we have a certain degree of free choice, but so much of it is what business has made available for us. Laurie Sadowski: That’s true as well. And it’s what we’re accustomed to when we’re growing up. I suppose that “tasting like I remember things” is a much better way to put it. Because if I think of, say, my grandmother’s pierogi from when I was a child, the real thing certainly doesn’t taste like what she would make – which was the real thing to me. But what you buy in the grocery store is certainly not going to taste like the real thing. And both of those are made with wheat. So I guess the goal is tasting it like you remember, or even better. Or actually, just even better. Caryn Hartglass: Okay, now, a little silly question – the picture of the woman on the cover – is that you? Caryn Hartglass: You don’t look like the person who’s in the picture! Who is that? Laurie Sadowski: She’s just the face of the Allergy-Free Cook. She does the job for me. Caryn Hartglass: Okay. Alright, I just had to know that. We have about a minute or two left, but I wanted to comment that in the beginning of the book, you really go all-out explaining all sort of different things – like if people want to substitute oil for butter or margarine, or how different flours will work…there’s really a lot of research that went in here. Laurie Sadowski: I definitely try to make it really accessible to everyone. For example, if you have an intolerance to a certain flour, or you really just don’t have access to it – like I have a friend in the UK who can’t find any sorghum flour for the life of her – so using those tips, she’s been able to make more than 25 recipes from both books combined because of what she knows would substitute well using those ingredients. So that’s what I try to do. Obviously, everything is the ultimate to be made as written, but it also makes it much more accessible to have a very close version, if you don’t have access to everything or can’t have it from an allergy or whatever reason. Caryn Hartglass: Well thank you, thank you Laurie Sadowski for this book, the Allergy-Free Cook Bakes Cakes and Cookies. It’s really a good one, and I can’t wait to dig in and start making some of these recipes, because they look really great. Laurie Sadowski: I’m excited to hear how it goes. Caryn Hartglass: Okay, well thank you for joining me on It’s All About Food! Have a very sweet day, a sweet year, and have good luck with this book. Laurie Sadowski: Thank you very much. Caryn Hartglass: I’m Caryn Hartglass, and you know this is It’s All About Food. I’ll be back in a few minutes, and we’re going to be talking about vegetarian boxing with Omowale “Wale” Adewale. We’ll be right back. 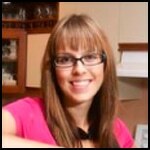 Hi everybody I’m Caryn Hartglass and we’re back for the second part of It’s All About Food here on March 12th, 2013. I wanted to remind you of a few things. You can send me an e-mail anytime during the show if you want to ask a question or anytime during the week: info@realmeals.org. How easy is that? info@realmeals.org and I love, love, love to hear from you. I really do, it makes my day. So, you can make me happy and send me a little message. That would be fun. And I’ll write back to you. Also, I wanted to let you know I’m going to be speaking around and I wanted to let you know what some of those engagements are. So March 24th, here in Manhattan we have a Veggie Pride Parade 2013. It’s going to culminate after the parade at the North End of Union Square Park. I spoke there last year and I will be very happy to be back this year. It’s usually in May but this year it’s in March. Let’s hope March goes out like a lamb and we have some very lovely mild weather there on March 24th. More information on that at veggieprideparade.org and then I’ll be in California in April speaking at the Berkeley Vegan Earth Day. Now you may know this, or not, but my birthday is on Earth Day, April 22nd, but Berkeley Vegan Earth Day is April 20th, 2013 at the David Brower Center in Berkeley, California. That’s going to be a lot of fun and I’m going to be joined by some other wonderful speakers like Jeanne Barr and Will Tuttle. Information at berkeleyveganearthday.com. Then, later in April, I’ll be in Miami at the Earth Day Miami Vegan Potluck. That will be at the Coral Gables Congressional Church and more information at earthdaymiami.org or you can just go to responsibleeatingandliving.com, my website, and click on the Talks Tab. If you have an event and you might want to have me come and speak send me an e-mail at info@realmeals.org. Caryn Hartglass: So that’s the events coming up and I’m really looking forward to that. We have another guest who is going to be on the show shortly. I know he’s here in the studio and I’m just waiting for him to come back in the room and join me. It’s going to be very interesting because we’re going to be talking about vegetarian boxing. He’s a champion vegetarian boxer. I know one of the things that really floors people when we talk about eating a diet based on plants is people really have a hard time believing that you can have athletic endurance and build muscle on plant foods. We have lots of different people today that are vegetarian or vegan and are super athletes proving more and more that people can fuel themselves just as well and maybe better on plant foods. I am going to bring on my next guest, and I just learned how to pronounce his name, which I wasn’t pronouncing correctly before, it’s Omowale Adewale and we just call him Wale. Right? Omowale Adewale: Well, it’s Omowale Adewale. Caryn Hartglass: You can put that headset on if you like. Then you can hear yourself and look really good. You already look really good. Omowale Adewale: Wale is great. Caryn Hartglass: Thanks for joining me. 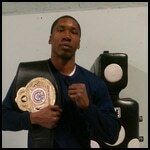 Omowale is a vegetarian champion boxer, boxing trainer and coach, and personal fitness trainer. He is also the co-founder of G.A.ME, an organization developed to address socio-economic issues facing poor black and Latino communities. Here we are and thanks for joining me. Omowale Adewale: Thank you for having me. I appreciate it Caryn. Caryn Hartglass: Now you don’t live here in New York, you’re just here for the month? Omowale Adewale: I do live in New York. Omowale Adewale: I was born and raised in Brooklyn. Omowale Adewale: Regarding the tour, I was going all over the place. Caryn Hartglass: OK, tell me about the tour. Omowale Adewale: The tour is designed, just like you were explaining to your listeners, really to show people that you actually can be strong and very fit and athletically-inclined, skilled, being a vegetarian or vegan. When I train, I’m a personal trainer as well, as you mentioned, and I always give vegan tips. I am vegetarian myself, I give vegan tips, vegan options, to every one of my clients. The tour really is designed to show people demonstrations and boxing from someone who is a vegetarian and at the same time give them opportunity to basically go through the steps a boxer might do, the ab work, some of the routines, learn some of the punches, have a little fun with it. The importance is to really show if people are looking to say, detox, because they want to weight manage. There are a lot of people who want to gain weight so when they see vegans… they hear someone is vegan or vegetarian they automatically think, “ok, this person is going to be thin.” A lot of vegans are thin because they want to. A lot of vegans are aware of where to get their proteins. Obviously, chia seeds, edamame, these are all legumes that are high, very high, in protein. There’s no other meat that you can get that’s going to actually rival chia seeds, hemp, edamame. There’s a top ten and edamame is way at the top. And second place was chia. So meat wasn’t even in the top two. Caryn Hartglass: So how did you get into your diet? Were you raised this way or was it something you decided for being an athlete? Omowale Adewale: No, I got a little lucky, I got lucky. I had a conversation with my brother, who is actually not vegan or vegetarian, when I was fifteen. I’m 34 now. Immediately I became vegetarian. I chose my mother’s birthday in August and I became vegetarian. Caryn Hartglass: What did he tell you? Omowale Adewale: I was in Florida, by myself, away from the family, going to high school and we just got into a discussion in terms of the things I was eating. How important it would be although he would never become a vegetarian. How important it was to basically respect life. How a lot of different ways we become to respect life in terms of animals. You know people say “clean kills”, obviously vegans don’t believe in any kind of clean kill of animals. I said, “I’m going to go vegetarian”. So I went vegetarian, cold turkey. I’m fifteen at the time. I didn’t have that many options. You have to be a little skilled…I’d like to segue a little bit, let me know if I’m off course…in terms of food access. I really didn’t have the knowledge in terms of food, what foods I can get to enrich my particular type of nutritional plan. So at the time I was eating rice, greens, and corn bread on a regular basis. You said hemp and edamame and I said “what is that?”. Lentils, the various kinds of lentils, I didn’t know what to get. So it was black beans, things out of the can. My diet was all off. We call that a lot of times…what would you call that?…junk food vegetarianism. Caryn Hartglass: Well, rice and cornbread isn’t really that junk food like junk food people are eating today with potato chips and cheese doodles but it’s pretty high starch. Omowale Adewale: But that was pretty much what my diet consisted of, on a consistent basis. You know, I said I don’t want to have any meat, eat this and that, it was a journey. I went to three or four doctors and they told me I had high blood pressure. This is while I’m vegetarian. So you have to get to a much higher sense of living no matter what type of dietary plan you have. I noticed that I was eating foods that were high in sodium and not enough potassium. As soon as I was introduced to juicing and I incorporated that into my diet, things changed. Phenomenal. Caryn Hartglass: I’m a big believer in juicing. I know it saved my life literally. People have different feelings about juicing. You’ve probably heard some of the “should you juice or not juice”. I think it’s a great thing. I don’t know that it’s absolutely necessary to juice but if you have a particular goal that you want to achieve, whether it’s a health crisis and you need to boost your immune system really fast, juicing is going to do it. If you want a fast boost of energy it’s the easiest thing to digest. It goes right to you. Just like people go for a caffeine fix, you go for a green juice fix, you’re going to feel that energy without the hangover afterwards that you’re going to get from junk. Omowale Adewale: Right. I also think with juicing a lot of people ask me in terms of you want to lose weight. I’m training some folks who want to lose weight and folks who want to gain weight and I add juicing into each one of those regimens. There might be differences in terms of when they incorporate other foods when they’re juicing. Generally, beets are excellent for basically cleaning your system. I usually have people juice a beet with some water, maybe two or three greens, you know some spinach, chard and some kale, broccoli, maybe two or three. It’s going to do wonders for the system because what beets do it’s going to flush your nutrients out as well. It’s going to flush a lot of the nutrients that you do need so that you’re going to need to try to retain the nutrients that you do have with juicing…A clean slate, a lot of people do fasting or detoxing so they get a clean slate so next time they start eating, a lot of that is out of the system. You might do that once every two or three days, so I recommend that in terms of those who are trying to lose weight or gain weight. Caryn Hartglass: Right. Tell me about this tour that you’re doing. Omowale Adewale: OK. Next stop I’m actually going to be in the Bronx. I’ve lived in the Bronx for ten years. I’ve lived in four of the five boroughs. So I’ll be at Hostos Community College. Caryn Hartglass: Hostos, we know that. Omowale Adewale: Yes, 2:15 Saturday March 23rd. It’s going to be youth-led. I have a young gentleman, he’s 20 years old, he’s also a boxer, in great shape. He wants to become a vegetarian. Omowale Adewale: So, he’s making excellent strides. He’s also doing my boxing class today and teaching young folks. Caryn Hartglass: Oh, thank you…Well it’s pretty serious with young people, especially in different neighborhoods, the poorer neighborhoods. I would say most people in America today know nothing about food and nutrition and we’re educated by commercials and little sound bites on the news and it’s all nonsense. And as a result a third of the population is obese, everybody’s sick, we have heart disease and diabetes, these are food-born illnesses that do not have to happen. So we have a serious crisis. But the people who are wealthy and upper-middle class, they have means. They can hire a trainer, they can hire consultants, they can do something about it, it is their choice. But the people that do not have means need help. Omowale Adewale: Right. I forget which hospital it is, I think Harlem Hospital that has McDonald’s in it? Caryn Hartglass: A lot of hospitals have McDonald’s, please. It’s science fiction, it’s ridiculous, it is comedy. Omowale Adewale: Of course, right, in the worse way too. A lot of these areas, like the Bronx, is the poorest congressional district in the nation. The sixteenth congressional district, the South Bronx specifically, you can go into say 161st where Yankee Stadium is, where the courthouses are, that particular location, you can’t find natural food, you can’t find a health food store. I talk to people all the time, even some of the folks who create these books for vegans and vegetarians or anyone who is vege-curious about where to go for vegetarian food tell you “there wasn’t much to put in the Bronx section”. There’s not much, especially in that particular area, it’s always assumed “well folks are not going to go, folks are not going to go”. I think that’s a huge problem. I think a lot of information, as you said, it’s kind of a disconnect between folks really getting food information. The fact that you have a lot of fast food in that particular area—McDonald’s, Burger King, you name it, diners, everything galore in that particular area. I look at it as almost an attack on that particular community. There’s something that has to be done and I think a lot of these discussions that we do have around food…This particular event that I’m going to be at March 23rd is the 11th annual, so you have folks that come in, there are nutritionists that have come in the past, there are farmers that will help with different information in terms of access to food but what we have to have something that’s consistent. A consistent discussion and dialog that doesn’t just leave and wait until next year or the next particular function. So what I’m doing, just like the young man that I’m working with and putting him under my wing, is trying to work with young people on a consistent basis. Really have more of a discussion, not just boxing, so even with this particular tour I’m trying to be accessible to folks, just give them free information, free accessible information, in terms of how can they get more protein into my diet? A lot of young people, some of the young men, want to be boxers. You know they say, vegetarianism, being a vegan, will bring down their weight. It doesn’t have to. You can still be very muscular to be able to do that. You can still get the right amount of carbs, the right amount of nutrition if you want to. You just have to apply the same discipline you have with McDonalds. You apply that same discipline, you’re going to look phenomenal. In terms of the barrage of the commercials that really attack the community, you see a lot of the billboards. Of course, why not go there? They must be ok. The FDA isn’t saying anything. I see it on a regular basis, so it’s a no-brainer, why not go to McDonalds? Why not get potato chips at the bodega. That’s what’s accessible, that’s what I can eat, right there. So what I’m trying to do is really have a consistent relationship, more than just a dialog actually, and discussion with the young people. But also work with them on a regular basis and …. I bring boxing, what I do with the tour and everything I do, boxing has really been excellent because boxing’s not so accessible but it’s something a lot of young people—and not just young boys, young girls as well—they want to box. They want to box. They want to be able to defend themselves. They want to be able to have fun. They want to get over their fear. They want to address bullying. I also encourage them to address their aggression that they have which a lot of vegan may say come on with the …. Omowale Adewale: …the meat, their particular diet. Also encourage that within the system. This is the kind of relationship that I’m trying to have and not just going to speak at these different engagements. After March 23rd the next one will actually be in Texas on April 6th, then after that I’ll leave US and go into Europe to Italy for the 27th. It’s a spot tour so I’ll be going around to the different festivals and speaking and of course I’ll be back in the US May 11th in New Orleans. Caryn Hartglass: Wow, good for you. Now do you make your own food or do you go out and eat out? Omowale Adewale: I cook so much it’s ridiculous. And I thought about it, one day—it had to be just a few days ago—I was in cooking and I said, “wow this is why people complain about juicing because they have to clean up after”. You want to be healthy? What are the most important things? What are the three important things to you? Would it be your children? Your children want to keep you around, right? You want to be able to stay around. You want to have better health so therefore this is a small sacrifice in terms of cleaning up after you juice. People talk about that all the time so I’m in my head saying, wait, ok, let me try to address them where they are, right? And say ok, try to find this juicer, this juicer is easier to clean. You don’t have to do too much cleanup on that. I think that you have to make things easier, much as McDonalds makes things easier in terms of making it 99 cent menu, you know we have to make it easier, as well. Caryn Hartglass: This is the problem with our culture. It’s a problem. Everybody has to have things easy and I’m not sure when this happened and when we got so soft but you know, no pain, no gain. Caryn Hartglass: I juice every day and most of the time I make it, sometimes I’m fortunate my partner Gary will make it for me but it’s a commitment, it’s a religion because I had advanced ovarian cancer six years ago and I don’t have it any more and I know a piece of it had to do with…. Caryn Hartglass: …juicing and cramming dark green vegetables. That’s my story and I’m sticking to it and I juice. What I say is like what you said: You deserve it. I don’t even think of it as a sacrifice. I think of it as a gift, a gift to me. I’m cleaning this juicer, it’s not a problem. Just change your perspective: This is a gift, this is doing wonderful things. Don’t be so lazy. Omowale Adewale: Right. See we understand this. But the problem is we’re up against, you know, heavy hitters. Omowale Adewale: You know billion dollar budgets and marketing. At the same time I do agree and I feel I go back and forth with some of those who are working with me longer, I’m like “listen, just do it”. Caryn Hartglass: Just do it. Omowale Adewale: Just do this and stick to it. Caryn Hartglass: Some people don’t have to juice. You know they could make a blended salad which is a lot easier and they can put their dark leafy green vegetables in and put their chia seeds in. It’s easy. The cleanup is easy. You can take it with you. OK. And that’s fine too…But get into your kitchen, get to know it and stop complaining. If you want results, right? Caryn Hartglass: We have one minute so wrap it up really nice. Omowale Adewale: Well the segue, we were talking about young people to veer off a little bit, a young man was murdered on March 10th Kimani Gray, I don’t know if your listeners were familiar… Police were in plain clothes and they stopped him and they shot at him eleven times, hit him six times. In my mind it’s kind of this dichotomy attack of poor access to food and poor food decisions that young people make, these issues in terms of stop and frisk, a lot call it police harassment or police murder…these two issues that are going on. I want to leave with that and ask people to attend March 23rd so we can have more of a discussion in terms of food and our young people. Caryn Hartglass: Thank you Omowale Adewale for joining me on It’s All About Food.